This Christmas I am determined to get a proper Christmas jumper. One reason being I will probably be working Christmas day - boo :'( - so I want to feel as festive as I can & secondly I have never actually worn a proper Christmas jumper; shock horror! I've also been seeing a fair few wishlists out there of other bloggers Christmas jumpers and I just felt inspired to put one together! I think my favourite jumper I have picked has got to be the cute little penguin, which is from New Look. I think its a 3D jumper which I think is just adorable! My second favourite has got to be the 3rd jumper which is from Miss Selfridge, I definitely think its a longer length so would be perfect with leggings which I prefer wearing compared to jeans. Actually, I just love all the jumpers... maybe i'll buy them all? 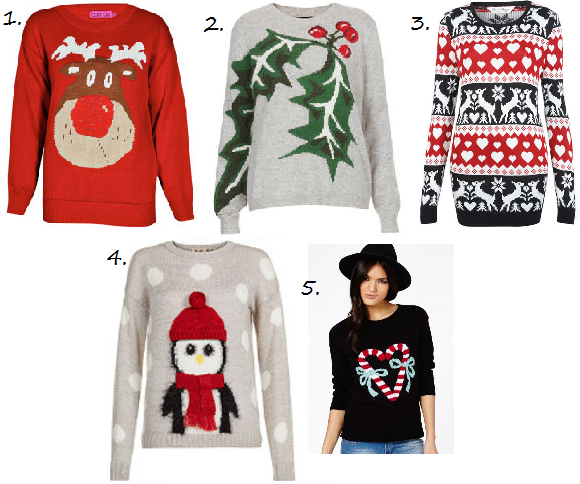 Do you have a Christmas jumpers wishlist?